Sticky palmed version of the popular POLARTEC® POWER STRETCH® glove. The silicone palm print gives excellent dexerity and the touchscreen finger and thumb make them touchscreen compatible. Close fitting, lightweight glove using POLARTEC® POWER STRETCH® fabric for excellent moisture transport, stretch and durability. Roll tip fingers provide greater dexterity and the double layer cuff is comfortable and warm, stopping any drafts. A Silicon print across the palm and fingers adds long lived grip for active sports such as running, cross country skiing and walking in cool weather. 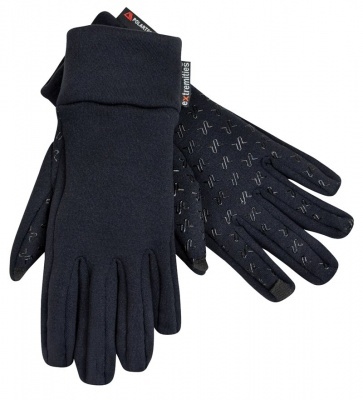 The first finger and thumb are touchscreen compatible so theres no need to remove your glove. Can be used on its own or part of a layering system in very cold weather.